I was so excited today. Since moving in, I’ve been cooped up in the house a lot trying to finish unpacking, organizing and setting up our last room (it’s a guest room meets office meets sewing room meets gym). But tonight, Hubs had suggested we go to a free campus event. It was a new hypnotist with some high tech equipment for audiences to vote on what the hypnotized specimens on stage would do, or something like that. I said sure since I LOVE hypnotists and especially now, I love getting out of the house. Right before we left, I panicked– What if I need a student I.D.? I’m not a student. He assured me I wouldn’t. Usually events that require those mention that in their advertisements. I have my old one somewhere, but it’s still packed away. I even had him re-check the website before making the trek into town to see if I needed a student I.D. No where online did it say one was required. Sweet. Well, when we got there, they wouldn’t let me in. I was so bummed. I had been looking forward to our date all day. We rushed home to try to find my old student I.D. to just have something to show in hopes they’d let me in, but we couldn’t find it. This may sound really lame, but our would-be awesome date night was saved by Hubs’ running out to get a carton of moose tracks ice cream, and cuddling on the couch to watch an episode of Hell’s Kitchen. That’s when it hit me. You know you have it good, when all you need to be happy is something as vanilla as ice cream. Those moments that aren’t really that special at all, really do mean the world. Sure, it would have been nice to go out. Heck, it would be great to be taken dancing or out to fancy dinners, but I know it can’t be like that all the time. The fact that Hubs made the effort to try to make up for the fact that our evening plains failed meant the world to me. It’s always good to step back and enjoy the little things in life, and especially find that person that you enjoy just being around regardless of what you’re doing. I’m glad I did. 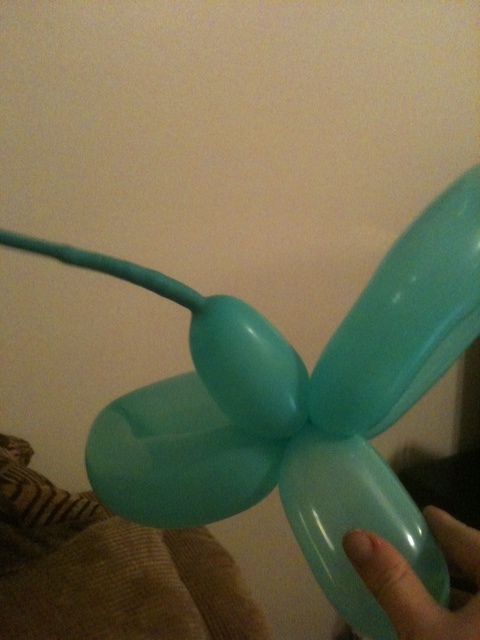 Did I mention he also raided my balloon animal supply stash to make me this “butterfly?” (Yes, I’m a balloon sculptor too. But that’s another story for another time) He’s a pretty special man (albeit, not a balloon sculptor by trade. But valiant effort). Hubs made me a “butterfly” to make me feel better. I love moose tracks ice cream my husband. I seriously cannot wait to hear more about your balloon sculpting!